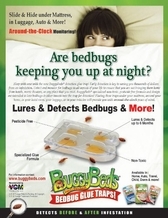 BuggyBeds brand bed bug detectors now on sale at Allergy Be Gone can help prevent costly infestations in your home. 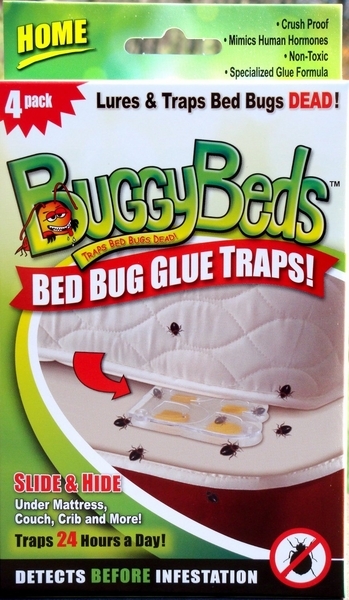 Avoid those itchy, burning bites caused by allergic reactions to the saliva in bed bugs with these early-detection BuggyBeds glue trap monitors. The crush-proof design allows easy placement and detection. Slip the custom-formulated glue traps between your mattress and box spring, beneath your couch cushions, in your car or in your suitcase. You don’t want to bring these notorious little hitchhikers home. If you see one or more trapped in the glue trap, you’ll know it’s time to call an exterminator. 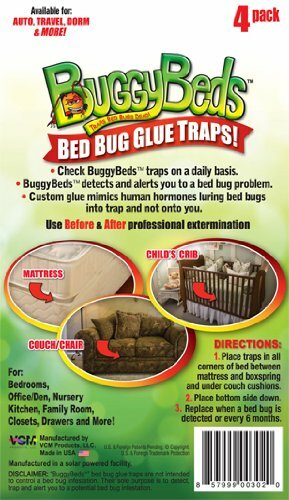 BuggyBeds® allows you to sleep with ease knowing that bed bugs will be detected and trapped before reaching your bed. Early detection is critical in identifying a bedbug problem and key to potentially saving you thousands of dollars from an infestation in your home. The Home Pack includes four (4) custom formulated ready-to-use BuggyBeds® monitors that can be placed anywhere in your home.The VALUE Pack includes Twelve (12) BuggyBeds® monitors. BuggyBeds® specialized non-toxic, pesticide free formula and design is intended to lure bedbugs & other insects into the trap for detection! For continuous detection, use the monitors to detect bugs before & after professional extermination to insure the effectiveness of the treatment while providing peace of mind. Place BuggyBeds® monitors at each corner between mattress and box spring or in between sofa cushions. 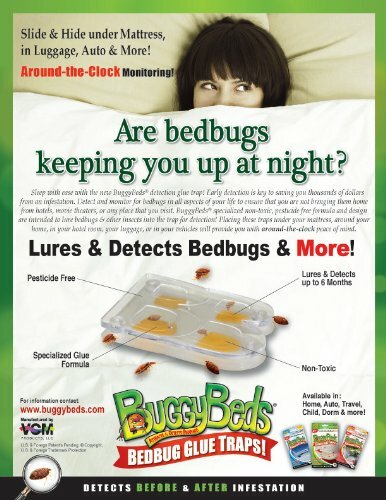 A simple visual check periodically of your BuggyBeds® monitors will allow you to detect bedbugs early! If one or more bugs are detected, we recommend that you call a professional exterminator for further evaluation. BuggyBeds® monitors are small and discreet (2" X 3") and can detect up to six months. Placing these monitors under your mattress and around your home will provide you with around-the-clock peace of mind. Placing these monitors under your mattress and around your home will provide you with around-the-clock peace of mind. If one or more bugs are detected, we recommend that you call a professional exterminator for further evaluation.